The Gracilaria bursa-pastoris is an abundant alga that is responsible for the eutrophication in Nador lagoon in Morocco. Therefore, the lagoon is a deposit of bioresources whose economic value can be enhanced. Antioxidative properties of seaweed extracts have been studied in several geographic regions, but only a few studies have been performed on tropical seaweed species, and no research has been done to determine antioxidant activity and valorization of the indigenous algae in Nador lagoon in Morocco. The present study evaluated the antioxidant potential of methanolic and aqueous extracts from Gracilaria bursa-pastoris by measuring the 2,2-diphenyl-1-picrylhydrazyl (DPPH) radical scavenging activity and total content of phenolic, flavonoids and flavonols content in each extract. This study showed that this macroalgae contained a high total phenolic content (142.26 and 79.43 mg GAE g−1 extract) for ethanolic and aqueous extracts, respectively. All extracts exhibited a DPPH radical scavenging activity, and the methanolic extracts demonstrated a great antioxidant potential with very low value of EC50 (0.085 mg/mL), significantly equivalent to EC50 (0,028 mg/mL) of commercial antioxidant ascorbic acid. These results suggest that the macroalgae have a great antioxidant potential which could be considered for future applications in medicine, food production or cosmetic industry in Morocco. This work showed that the ethanolic extract was rich in phenolic compounds. This extract exhibited the highest antioxidant activity which may be explained by the presence of a large quantity of phenolic compounds. The Gracilaria bursa-pastoris can be utilized as a source of natural antioxidant compounds. Since the year 2000, the seaweeds have attracted attention in the search for bioactive compounds to develop new drugs and healthy foods [1, 2]. In particular, these organic resources are a very important and commercially valuable resource for food, fodder, soil conditioners, pharmaceuticals, and production of green energy [3, 4]. Marine macroalgae are a valuable food resource which contains low calories, and they are rich in vitamins, minerals, proteins, polysaccharides, steroids, and dietary fibers [5–7]. In 2004, Ahn et al. has confirmed the presence of bioactive compounds such as vitamins, minerals, dietary fiber, and polysaccharides in some seaweeds. On the other side, some authors have found other special bioactive compounds such as alkaloids, terpenes, bromophenols, phlorotannins, ascorbic acid, tocopherols, and carotenoids, in algae which have antioxidant potential [8–13]. These observations suggest that these bioactive compounds can have strong antioxidant properties. The search for natural antioxidant compounds has gained considerable attention and the number of publications on antioxidants and oxidative stress has nearly quadrupled . Because the antioxidant compounds play an important role against various diseases (Chronic inflammation, atherosclerosis, cancer, and cardiovascular disorders) and aging biochemical processes, this explains their considerable commercial potential in medicine, food production, and the cosmetic industry [15, 16]. Currently, the utilization of antioxidants from natural sources is accentuated because the consumers prefer natural products and they are afraid about the potential toxic effects of synthetic antioxidants . Most countries have limited the use of synthetic antioxidant compounds in the food products because of their side effects . Thus, it is essential to develop and utilize effective natural antioxidant molecules. The Nador lagoon, also called Marchica lagoon, is the only lagoon ecosystem in the Moroccan coast facing the Mediterranean Sea . It covers an area of 115 km2 with water depths from 3 to 8 m. [19, 20]. The daily discharges of domestic, agricultural, and industrial waste into the lagoon stimulate the proliferation of algae called “harmful algal blooms” . Gracilaria bursa-pastoris is an abundant alga that is responsible for the eutrophication in this lagoon . The choice of this alga (Gracilaria bursa-pastoris) was based on its potential source for the extraction of new natural medicines, its important role for industrial and biotechnological applications due to its content of phycocolloids, the main source of agar α-(1,4)-3,6-anhydro-l-galactose and β-(1,3)-d-galactose with little esterification in cell wall, the content of bioactive metabolites like the primary compound with antibiotic activity acrylic acid . Therefore, the lagoon is a deposit of bioresources whose economic value can be enhanced. Antioxidative properties of seaweed extracts have been studied in several geographic regions, but only a few studies have been performed on tropical seaweed species and no research has been done to determine antioxidant activity and valorization of the indigenous algae in Nador lagoon in Morocco [23–26]. Faced with the challenge to valorize this natural wonder, it is necessary that total phenolic content, total antioxidant capacity (in soluble of lipid and water), total protein, total carbohydrate, and vitamin (A, C, and E) contents were determined in Gracilaria bursa-pastoris, in order to identify the new resources of natural antioxidant molecules. 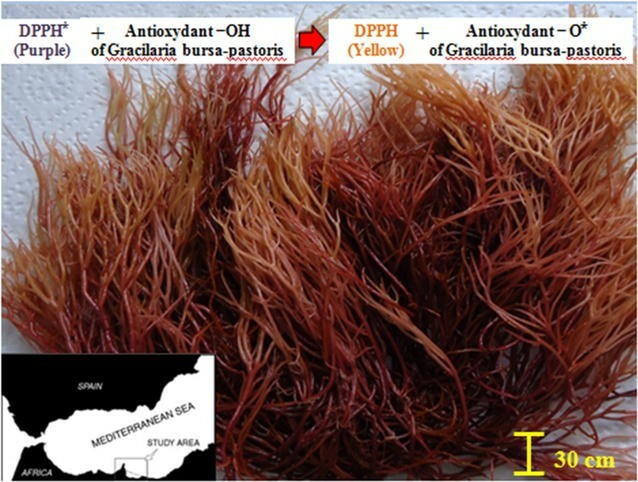 The present study evaluated the antioxidant potential of methanolic and aqueous extracts from Gracilaria bursa-pastoris from Nador lagoon in Mediterranean Moroccan costs by measuring the 2,2-diphenyl-1- picrylhydrazyl (DPPH) radical-scavenging activity and total content of phenolic, flavonoids, and flavonols content in each extract. 1,1-Diphenyl-2-picrylhydrazyl (DPPH•), potassium ferricyanide (K3Fe3 + (CN)6), trichloroacetic acid (TCA), ferric chloride (FeCl3), β-carotene, linoleic acid, Tween-40, Folin–Ciocalteu’s reagent, ammonia solution (NH3), sulfuric acid (H2S04), hydrochloric acid (HCl), picric acid, acetic anhydride, chloroform, Fehling’s solutions A and B, sodium carbonate, Aluminum chloride (AlCl3) and bovine blood, ethanol, methanol, acetone, and hexane were obtained from Merck (Darmstadt, Germany). Gallic acid, Quercetin, Tannic acid, Butylated hydroxyanisole (BHA), and Butylated hydroxytoluene (BHT) are used as positive standards. Authentic standards were purchased from Sigma-Aldrich, Fluka, and Merck. All other chemicals used were of analytical grade. 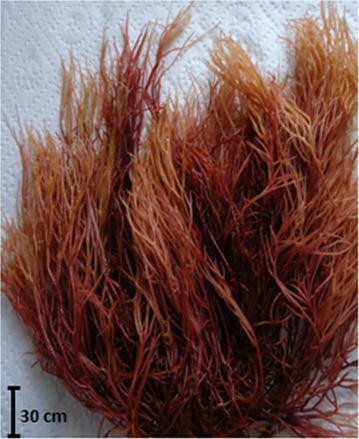 Red algae Gracilaria bursa-pastoris was collected from Nador lagoon in May 2015 (Fig. 1). The algal species was identified by Professor N. Elkhiati. In the laboratory, the algae was carefully cleaned, washed several times with tap water, distilled water, then dried by oven at 40 °C, ground, and kept in dark (Fig. 2). Macroalgae plant was lyophilized and milled into powder before extraction. Lyophilized samples (10 g) of Gracilaria powder were macerated with 50 mL of ethanol. The mixture was stirred under ambient temperature for 4 h or refluxed at 40 °C for 2 h. After filtration, the solvent was concentrated on a rotary evaporator under reduced pressure at 40 °C. The aqueous extracts were prepared by the same method using distilled water and extracts were concentrated by drying at 40 °C and stored at − 20 °C. For each extract, different concentrations (0.02, 0.04, 0.08, 0.16, and 0.32 mg/mL) were prepared from the algae powder and then tested for antioxidant activity. Y: The absorbance. X: The concentration of gallic acid in mg/mL. Y: the absorbance. X: the concentration of quercetin in mg/mL. Aqueous and ethanolic extracts were subjected to screening for their possible antioxidant activities. The antioxidant activity was assessed using 2,2-diphenyl-1-picrylhydrazyl (DPPH) radical-scavenging assay and ascorbic acid bleaching test. DPPH can be used to accurately titrate the oxidizable groups of biomolecules , and has commonly been used to estimate the antioxidant capacity of complex mixtures including plant oils, many of which contain high concentrations of monoterpenes . The free radical-scavenging activity of aqueous and ethanolic extracts was measured according to the method of Brand-Williams et al. 1995 using the stable 2, 2-diphenyl-1-picrylhydrazyl radical (DPPH). The model of scavenging DPPH radical has been widely used for estimating the free radical-scavenging activities of plant extracts/antioxidants . DPPH radical is a stable-free radical, so the antioxidants are able to reduce DPPH radical to the non-radical form DPPH-H. The DPPH-scavenging activities of antioxidants are attributed to their hydrogen-donating abilities  (Fig. 3). The results were expressed in percentage of inhibition of DPPH. A sample: the absorbance of test extract. A blank: the absorbance of the control reaction. The IC50 value represents the concentration of the extract required to quench 50% of DPPH under experimental conditions. The total phenolic and flavonoid content of the extracts, as estimated by the Folin–Ciocalteu reagent method, were 79.43 and 142.26 (mg GAE/g extract) at 40 °C and 27.47 and 36.61 (mg Q g−1 extract) at 20 °C for aqueous and ethanolic extracts, respectively. The total flavonol contents were 59.04 and 64.87 (mg Q g−1 extract) at 40 °C and 19.22 and 49.12 (mg Q g−1 extract) at 20 °C (Table 1). These results showed that the higher content of total polyphenols was found in the ethanolic extract which constituted the major antioxidant compounds. Also, we notice that total phenolic and flavonol are the major extracts at 40 °C more than at 20 °C. It demonstrated that heating promotes the extraction of antioxidant phenolic and flavonol compounds. In contrast, flavonoid content is weakly higher at 20 °C. The temperature affects the extraction processes by varying the alga matrix properties, solvent, pressure, and time . In fact, temperature increases mass transfer during extraction by destroying the alga membrane structure, thus enhancing extraction and decreasing extraction time . Yildiz et al. reported a low phenolic content in the Turkey G. bursa-pastoris methanolic extract (0.35 mg Gallic acid/g). This difference could be attributed to the origin of the marine algae. Much of literature refers to the plant phenolics compounds' direct antioxidant effect. Results of free radical-scavenging activity of aqueous and ethanolic extracts are given in Table 2. Data in the table indicated that the radical-scavenging activities of the extracts increased with increasing concentration from 0.02 to 0.32 mg/mL. It is showed a very strong antioxidant activity of G. bursa-pastoris ethanolic extract. This extract exhibited the highest activity with a very low EC50 (0.085 mg mL−1) significantly equivalent to EC50 of the commercial antioxidants tested, ascorbic acid (0.028 mg mL−1). The antioxidant activity of ethanolic extract was found nearly two times higher than that of aqueous extract. Phenolic compounds are widely distributed in seaweeds and are known to exhibit higher antioxidative activities and chemopreventive agents . According to this result, it is clearly indicated that G. bursa-pastoris has a high antioxidant activity. Phenolic compounds in this marine alga are correlated with antioxidant activity and also dependent on the solvent and algal species used for extraction . Basically, increase in total phenolic content may increase antioxidant properties. Phenolic compounds act as electron donors and may neutralize the unwanted reactions created by free radicals in the body. The positive correlation between polyphenolic content of algae and its antioxidant activity is well documented . More recently, Jimenez-Escrig et al. determined that the DPPH-free radical scavenging by brown and red algal extracts were positively correlated with the total polyphenol content of these extracts. Several studies have demonstrated a highly significant correlation between the phenolic content and the antioxidant activity in seaweed extracts, [38–41]. These results suggest that the antioxidant activity of G. bursa-pastoris extracts could be correlated with its high phenolic content. This study showed that the ethanolic extract was highly rich in phenolic compounds. This extract exhibited a highest antioxidant activity which may be explained by the presence of a strong quantity of phenolic compounds. The results obtained in this study shows that G. bursa-pastoris can be utilized as a source of natural antioxidant compounds. Therefore, the G. bursa-pastoris seaweed, due its easily accessible source of natural antioxidant molecules, may become valuable for the development of therapeutic products, food supplement, and pharmaceutical applications. MR, BH, and NE designed the experiments; MR, OE, and NS performed the experiments; OE, FT, MM, MR, and OZ wrote this manuscript. All authors read and approved the final manuscript. The authors warmly thank Abdelhakim Mesfioui, Director of Nador INRH, and Ahmed Chihani a diver in Nador lagoon for all the necessary materials needed for collecting G. bursa-pastoris macroalgae. All authors approved to the ethics approval and all authors actively participated in the creation of this excellent work.